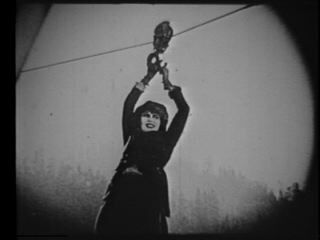 The Perils of Pauline, one of the earliest American movie serials and a classic example of the damsel in distress genre, premiered in Los Angeles on April 4, 1914. Every week for twenty weeks, actress Pearl White faced imminent danger and sure death at the hands of pirates, hostile Indians, gypsies and various mustachioed villains, escaping at the last possible second through her own ingenuity, resourcefulness and pluck. Her adventures in Pauline and the follow-up Exploits of Elaine were popular movie fare through the 1920s. Neither serial was a true “cliffhanger” in which episodes end with an unresolved danger to be resolved at the beginning of the next installment. Instead White jumped in and out of the jaws of death in each installment. Like many other silent film stars, Pearl White performed her own stunts for the serial, at considerable risk. 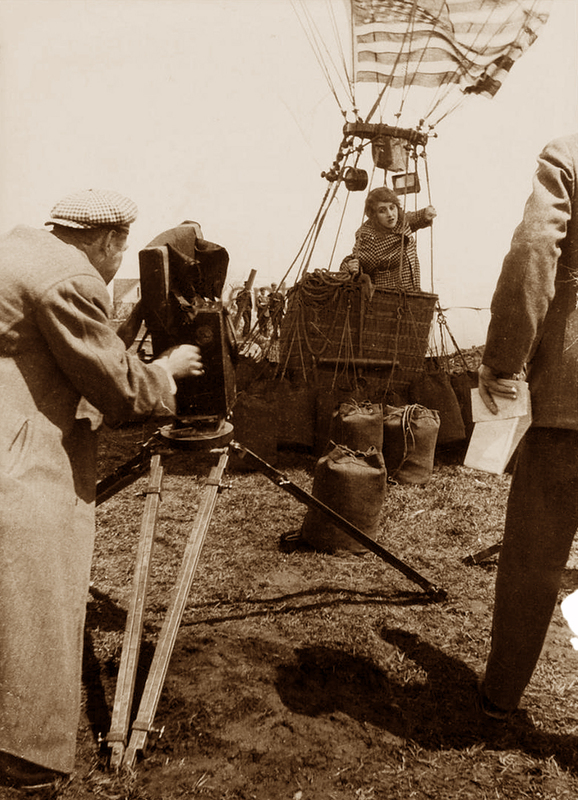 During one scene, the hot-air balloon she was piloting escaped and carried her across the Hudson River into a storm, before landing miles away. In another incident, she permanently injured her back in a fall. And of course White was more than once tied to railroad tracks by a mustache-twirling villain. One such scene was filmed on a curved trestle in New Hope, Pennsylvania on the Reading Company’s New Hope Branch. Now referred to as “Pauline’s Trestle,” it is a tourist attraction offering rides from New Hope to Lahaska, Pennsylvania, across the original trestle. Stopping for a moment, she convinced herself that she had to have a good lead over her pursuers, if they were even following her. She had to find Paul. Looking around, however, she realized that not only didn’t she know where Paul was, she didn’t know where she was. She decided to work her way back in the same general direction from which she thought she had come, keeping herself hidden. If they were chasing her, they would not be stealthy. She’d hear them before they saw her. And try to find Paul. Or someone else to help. But who? She pulled herself up to her hands and knees and looked around. 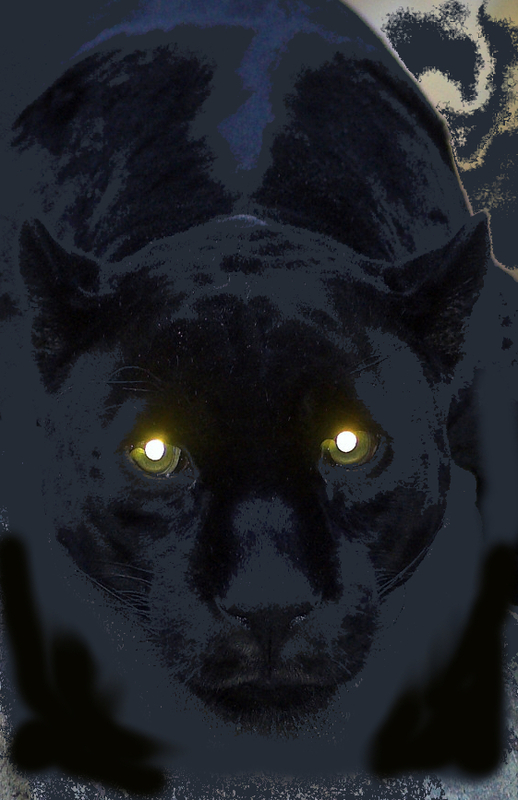 There just a few feet ahead of her, two golden eyes blazed in the dark. At first they were disembodied, hovering in the air, but as they stared at her, she began to discern an outline of whatever it was that possessed the eyes. It was big, really big, and as black as the night around it. It was a cat, at least four feet at its shoulders. And it wasn’t purring. Get me off this cliff. Admission was ten cents. The movie lasted about an hour. There were no cartoons or newsreels. The first theater to show an actual movie was the Electric Theater in Los Angeles on April 2, 1902. The Capture of the Biddle Brothers was an adventure melodrama based on actual events. A few months earlier, condemned prisoners Jack and Ed Biddle escaped from a Pennsylvania jail using tools and weapons supplied to them by the warden’s wife, Kate Soffel. “Our picture, which is a perfect reproduction of the capture, is realistic and exciting,” the producer exclaimed — breathlessly one might imagine. Two sheriff-filled sleighs pursue the Biddles and Soffel through the white and drifting snow. The dastardly trio turns to make a stand, shotguns and revolvers blazing. Ed Biddle is shot, falls to the ground in a snow bank. On one elbow, he continues to fire shot after shot until he collapses. The second Biddle continues to fire, and he too is shot. Mrs. Soffel seeing the hopelessness of their situation, if not the error of her ways, attempts to shoot herself. 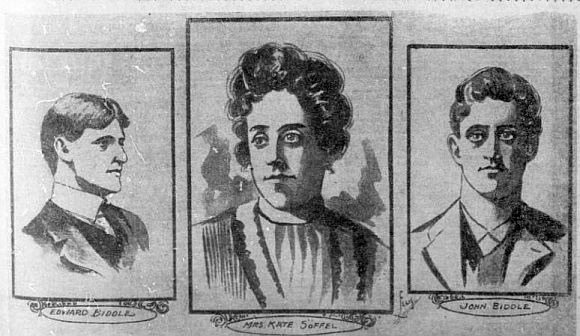 All three are captured. The brothers both die of their wounds. Mrs. Soffel survives, but a reconciliation with her warden husband is probably unlikely. The movie itself did not survive, and the names of the actors are lost to history. 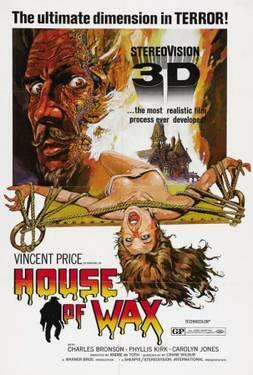 Oddly enough a remake — well maybe not exactly a remake — was released in 1984. Mrs. Soffel starring Diane Keaton and Mel Gibson once again tells the tale of the terrible, terrible Biddle brothers. But not for a dime. He’s a skinny kid with an obnoxious grin, big eyes, and an even bigger appetite. As a clock relentlessly counts down the minutes, this animated glutton devours a bag of popcorn, a hamburger, a hot dog and ice cream. With three minutes to go, it’s a candy bar. Two minutes, pizza. One minute — not another bag of popcorn! He licks his fingers one at a time, gives us a final grin, and invites us to enjoy the second feature. If that kid brings a tear to your eye, a tiny tug at your heartstrings, then you too lived your salad days during the Age of Popcorn with Real Butter — in the America of the drive-in theater. What a wedding of technology and environment, the drive-in — John Wayne and Grace Kelly and Rock Hudson up there, larger than life, against a starry backdrop that stretched forever. For me, drive-in theaters provided not only countless evenings of entertainment; one drive-in also gave me my first summer of gainful employment. They all had names like Star View, Auto View, Park View (or Vu in the spelling fashion of the day) so that you knew right away that it wasn’t a hardtop, a wonderful but not widely-used name for the traditional indoor theater back in the late fifties when the abundance and importance of drive-ins required such distinctions. 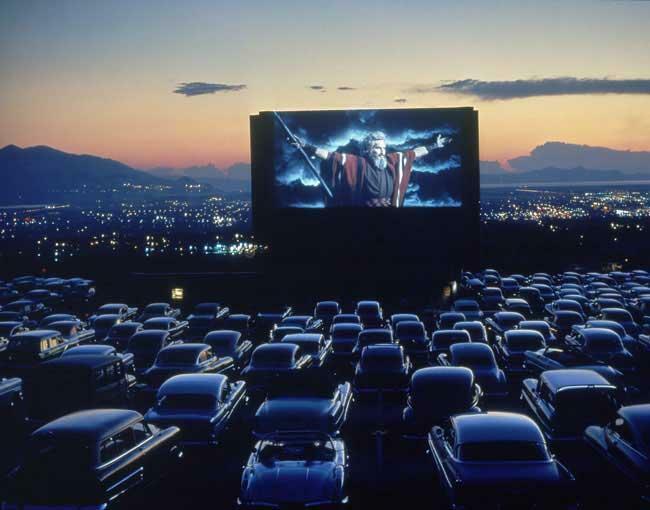 My drive-in was the Romantic Motor View, and romantic it was — the entire Salt Lake City valley stretching out beyond its screen, Mount Olympus looming behind. The Motor View was a family affair, owned and operated by the Petersons — in fact, the Petersons lived in their theatre: their home formed the base of the massive wide screen. Old Man Peterson, red-faced and ill-tempered, yelled at people and cooked while his wife and daughters stood behind the counter and worked the hungry crowd. At intermission, a storm cloud of salt and pepper and more salt and pepper rose over the grill as Old Man Peterson, caring not a whit about hypertension or cholesterol, turned out burger after burger. They were the best burgers I ever tasted even though each one took a week off your life. In a nearby room, a brother-in-law ran the projector, and outside, a Peterson son held sway over a two-acre asphalt empire and everything in it, including me. Upon my arrival each evening, I took up a post near the huge chain-link gate that separated the three-hundred-car auditorium from the nonpaying public. Between the highway and me stood the double-bayed ticket booth that resembled a drive-up bank teller more than a box office, positioned so that up to fifty cars could wait in line without blocking traffic. Patrons received tickets at the booth, then drove to the gate where I would deftly tear their tickets in half. I wondered, of course, why they didn’t place the ticket booth at the gate, dispense half tickets and eliminate an extra step, but I was making thirty-five cents an hour and I wasn’t about to speak up and abolish my own job. Tearing tickets was mindless activity at best, so I otherwise occupied my mind by trying to guess which car would hit which little kid on his or her way to the playground, access to which required fighting incoming traffic. I also pondered big questions such as why so many teenagers came to drive-ins alone until I began to hear the giggling from the trunk. Perhaps I should have said something, but I found anyone old enough to drive quite intimidating. The playground closed twenty minutes before showtime, freeing the Peterson son from his duties as operator of the four-horse carousel, so he could relieve me at the gate. This in turn allowed me to wander through the rows of cars, squeegee in hand, ready and willing to wash windshields. During the first movie, I was expected to stay near the exit to somehow prevent anyone who was determined to sneak in without paying from doing so. I was also to watch for signs of clandestine entry over the six-foot fence that ringed the Motor View. Then, as the first movie ended, I would stand at the center of the exit, waving a flashlight, directing outbound traffic, as if a 95-pound kid could control a stampede of Fords and Chevys and Plymouths, each with some kind of special permission to be the first car out. During the second feature, I continued to keep an eye peeled for signs of illegal entry while roaming the drive-in as kind of a trouble-shooter whose main concern was turning off speakers when cars left. The Petersons believed that leaving them on was wasting sound. Frequently though, I’d just sit down against a speaker post and watch Sayonara for the fifth time or To Catch a Thief for the third. Occasionally, I’d sleep. I worked there just that summer of ’56, but I became a regular patron of the Motor View and many other Views and Vus. 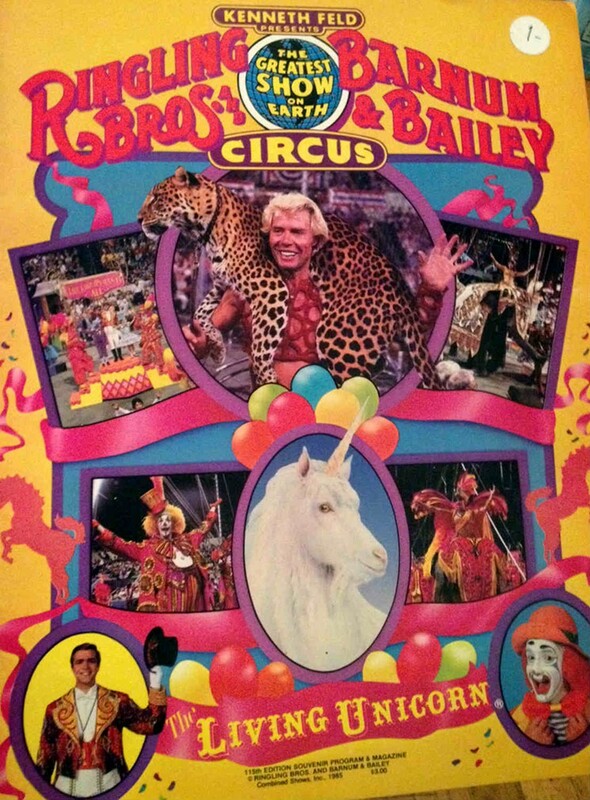 And yes, I would occasionally enter via the trunk of an automobile, but I didn’t like it one bit. I fully expected to die there in the darkness because Psycho had already started and my friends in the front of the car had forgotten me. Or that if the trunk lid did open, I would find myself facing the entire Salt Lake police force, guns drawn, trigger fingers itching. Summer after summer, the drive-in experience gradually evolved from that of trying not to park next to prying adults who disapproved of what you were doing in the privacy of your own (parent’s) DeSoto to trying not to park next to libidinous teenagers who were doing God knows what (and how) in the back seat of that VW bug. 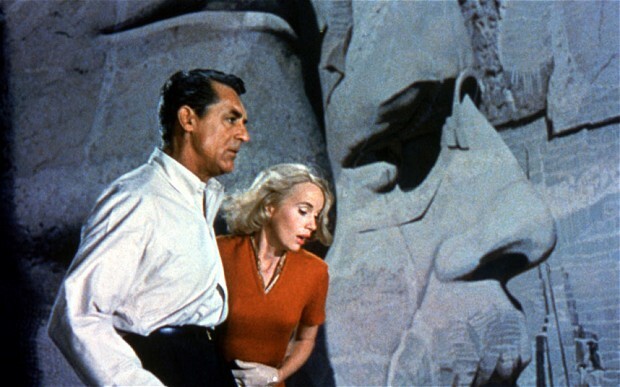 Over the summers, drive-in film fare changed as well: Sayonara and To Catch a Thief gave way to Teenage Cannibals Eat Peoria and Sexual Fantasies of a Swedish Meatball –a death knell to come. There are few drive-ins left, and they are endangered. The kids prefer cineplexes in malls, and their families watch cable or stream Netflix. No one seems to find stuffing three or four adolescent bodies into the trunk of a car or watching a movie through moving windshield wipers fun anymore. Maybe the drive-in really does belong to another era, those years that marked the height of America’s love affair with the automobile, when gas stations commanded all four corners of busy intersections and no one yielded to pedestrians — they’re mostly gone, like the faithless lover’s kiss that was (to quote the movie I saw six times) written on the wind. And somewhere that little kid with the obnoxious grin sits, watching TV, stuffing himself with popcorn. He’s fat now, and there’s fake butter on the popcorn. 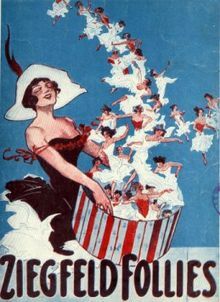 Ziegfeld was particularly noted for his series of theatrical revues, the Ziegfeld Follies, inspired by the Folies Bergère of Paris – spectacular extravaganzas, full of beautiful women, talented performers, and the best popular songs of the time – and was known as the “glorifier of the American girl”. He also produced musicals in his own newly built Ziegfeld Theatre – Rio Rita, which ran for nearly 500 performances, Rosalie, The Three Musketeers, Whoopee! and Show Boat. Several of his musicals hit the movie screens, including three different versions of Show Boat. William Powell played Flo in the 1932 biopic, The Great Ziegfeld, and a 1946 film recreated the flamboyant Ziegfeld Follies. Who’s our protagonist? Paul? 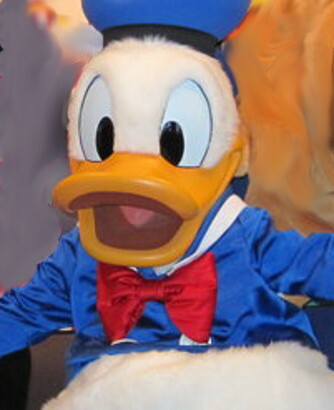 Huey (the duck)? Or two protagonists for the price of one? Find out here. If asked to name an important sculptor, the name John Gutzon de la Mothe Borglum, would not come tripping off most people’s lips, although his most important work certainly would. Borglum died on March 6, 1941, leaving the monument he had worked on since 1927 uncompleted. 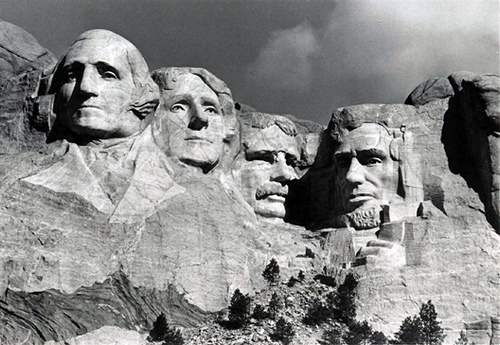 Borglum sculpted big: a portrait of Abraham Lincoln carved from a six-ton block of marble, a 76 by 158 foot bas-relief of Confederate heroes, and what would have been his biggest ever, the 60-foot heads of George Washington, Thomas Jefferson, Abraham Lincoln and Theodore Roosevelt carved into the granite face of Mount Rushmore in South Dakota. 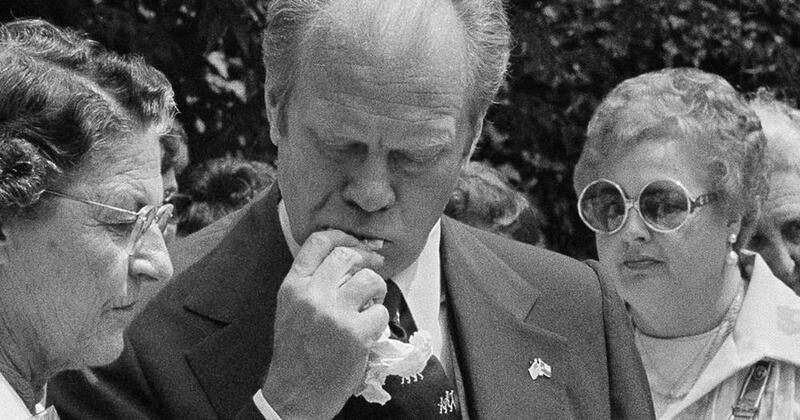 Although his work remains admired, his legacy was tarnished by his strong nativist leanings, including membership in the Ku Klux Klan. 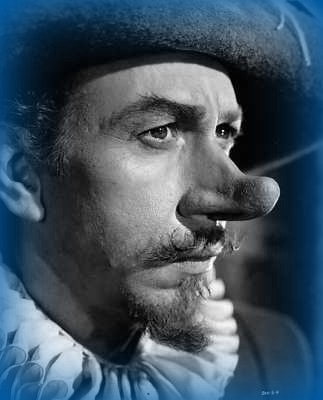 Cyrano de Bergerac, born in 1619, is of course best known in the modern times for his nose. According to legend, it was quite large. Depending on which account you accept, Cyrano was either a French aristocrat, author and military hero with a big nose or the descendant of a Sardinian fishmonger who suffered from syphilis with a big nose. He was an early writer of science fiction, and in his most famous work, The Other World, Cyrano travels to the moon using rockets powered by firecrackers where he meets the inhabitants who have four legs, musical voices, and firearms that shoot game and cook it — the TV rights are still available, if you’re interested. A lesser known work, Noses from Mars, is self-explanatory. Then we come to the story of Cyrano himself and how he courted the fair Roxanne on behalf of his friend Christian. Although these people are real, the story is alas! pure fiction, which is probably just as well, for Roxanne was Cyrano’s cousin and had they ever consummated their relationship, their children would have been half-wits with big noses. 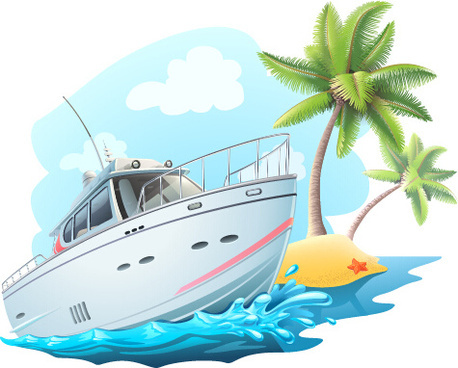 Toussaint conned his small motorboat to the empty spot at the pier, near where Roberto lolled, dangling his big bare feet in the warm water. The boat, like Toussaint’s shirt and shorts, had the scars of a life well lived. On each side, the hand-lettered word taxi just above the waterline made it an official vehicle for transporting passengers up, down, and around the island’s seven-mile coastline. Toussaint nodded and took up a cross-legged position next to Roberto. “What’s the matter?” asked Toussaint. “Of course not,” said Toussaint with a reassuring grin. “But you’re no Jean Paul either.” Jean Paul was the young man held up as an example of what young manhood was all about. The other men didn’t like him much – he was so knowledgeable and so arrogant – but they had to grudgingly agree that he was the handsomest of them all. And he paraded his handsomeness and pursued all the young women on the island, even many of the tourists. His only notable failure was with Marianne, Roberto’s young woman at Pigeon Beach, and this gave Roberto some small satisfaction. But as Toussaint tactfully pointed out, if Jean Paul couldn’t win Marianne, what possible chance could Roberto have? “You should say something to her,” Toussaint argued. “You can’t expect her to pay you no mind, standing there like the ghost of Albert Verra.” In island history, Albert Verra had the dubious distinction of being the ultimate coward, selling out his island once to the French and once to the Spanish. 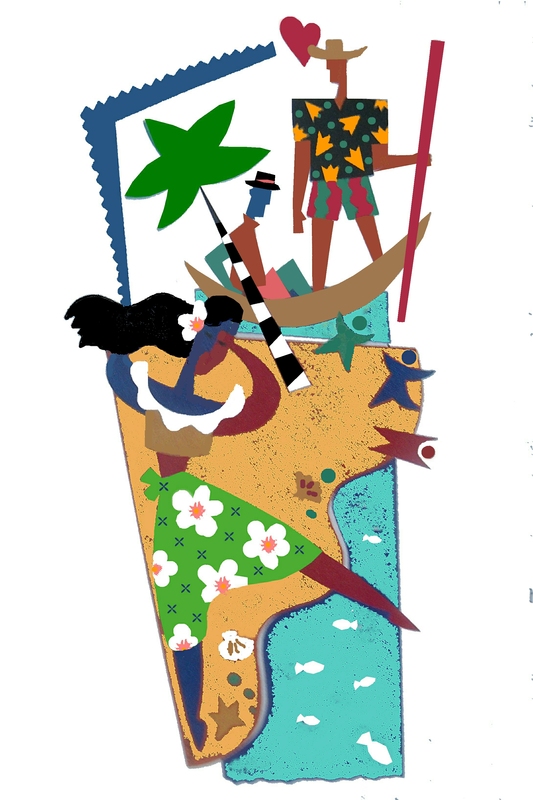 This story originally appeared in American Way, the inflight magazine of American Airlines. It is included in Calypso, Stories of the Caribbean. In November 1884, Ellen Keyse was found dead in the pantry of her Exeter, England, home. She had been beaten and her throat had been cut. John Lee, who worked for the wealthy victim was charged with the crime. The 19-year-old was found guilty and was sentenced to be hanged on February 23, 1885. 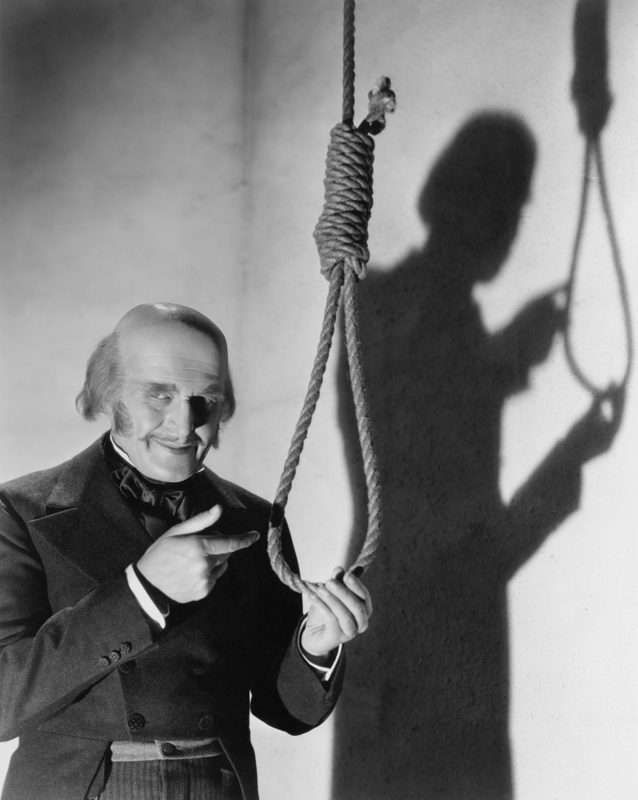 On the day of his comeuppance, Lee was led to the gallows, where his executioners placed a noose around his neck. They pulled the lever that would release the floor under him and drop him to his death. The big oops: John Lee was not dispatched — red faces all around. The apparatus had been thoroughly tested the previous day and had been in fine working order. They tried once again. Nothing. And again. Still a no-go. Flabbergasted, they returned Lee to his prison cell, while they pondered the situation. The authorities remained mystified, so they did what authorities often do when mystified. They attributed the malfunction to an act of God, and rather than risk God’s anger, they commuted his sentence and removed him from death row. He spent 22 years in prison, and upon being released, promptly set sail for America. 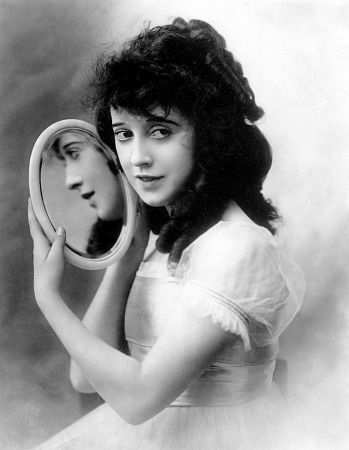 Silent film star Mabel Normand died on February 23, 1930, after a short but stellar career as an actress, screenwriter, director and producer. She collaborated with Mack Sennett and appeared with Charlie Chaplin in a dozen films and Fatty Arbuckle in another 17. 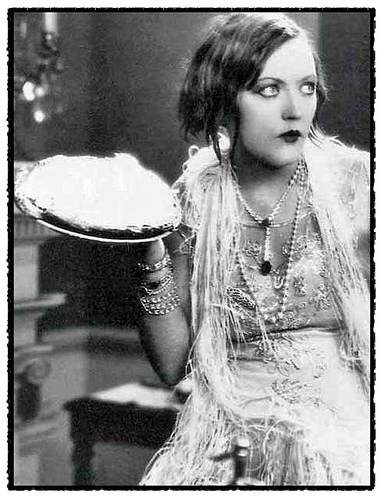 It was in one of those films, that she made cinematic history , in a scene that she became associated with for the rest of her career , when she received a pie in the face from Fatty Arbuckle. This bit of slapstick became a staple in comic films from then on, and it is the rare comedian who has not received at least one pie in the face. 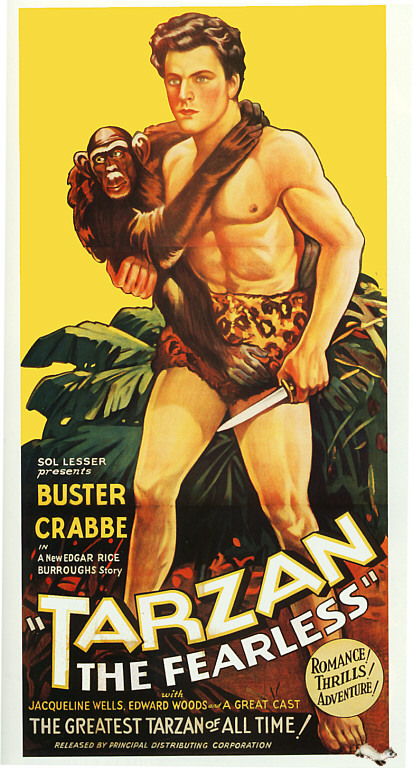 Pie throwing reached something of a peak in 1965 in the film The Great Race. In a technicolor pie fight scene that took five days and cost over $200,000 to film, a total 4,000 pies were hurled in just over four minutes.